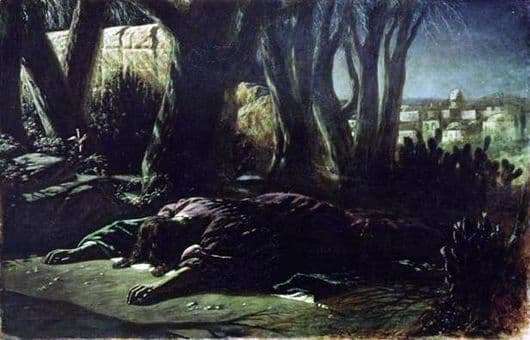 The Garden of Gethsemane is the retreat of Jesus Christ, where he prayed for the abomination of the cup of sins, the night before he was taken into custody. Very rare in visual terms, almost the only work on which there is no image of the very face of Christ. Perov did not accidentally take this step – by this he wanted to express the purity and holiness of the image of God. After all, any artist depicting Christ unwittingly endows him with human, worldly features, those thoughts and feelings, which he himself considers to be the truth. Perov did not depict the most, as it seems, expressive element in the image. Dark, dark trees and shrubs that appear transparent and ghostly, almost unpainted, hang over Jesus. And as a sign of martyr’s near death, as if a crown of thorns stood in the air above Jesus. Perov sought in this picture to show not even the divine, but rather the human nature of Christ, his worldly beginnings. He prays, falling down, feeling the fear of imminent death, in desperation asks his father to save him. And this momentary weakness expresses a great deal, in this figure that has fallen backwards there are more feelings than the expression of the savior’s face could express.